The things that are made by plans well laid the test of time will tell. 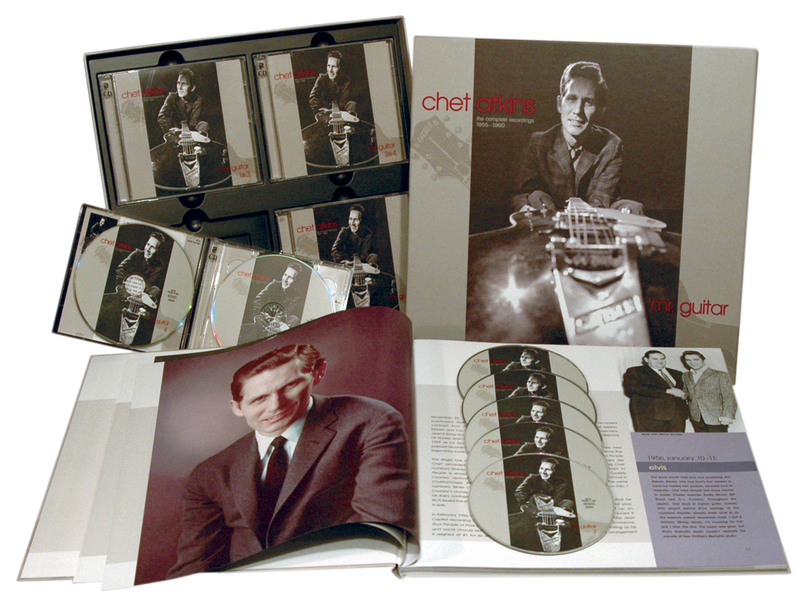 "When asked recently which of his hundreds of recordings was his personal favorite, Chet's answer was soft, but emphatic. 'I don't like any of them, nor do I like to hear them. I always notice some little thing I think I could have done better.'" "I played pretty good back in those days -- the 50s and 60s," he says. "I was brave and ignorant and I played pretty well. I really was ahead of a lot of people in those days. Now I am trying to catch up with everybody, but back in those days it was nice. I was kind of an innovator and I could pull it off very well. I can see that now. At the time I thought I was terrible, but that kept me improving and trying to learn to play better." "He was the guitar player of the 20th Century." First a guitar he designed with his name on it. Then, a guitar course in his name, and finally, a hit single. In 1955, eight years after Steve Sholes signed him to RCA Victor, Chet Atkins's instrumental rendition of the Chordettes' pop vocal hit Mister Sandman gave him the first hit single of his career. It didn't break the Top Ten, but it was a hit. Now the idol of country guitarists of all ages and persuasions, he was well along in his quest to become the world's best known country guitarist. He was in his early thirties, and the next phase would make him one of the world's most influential guitarists. Period. 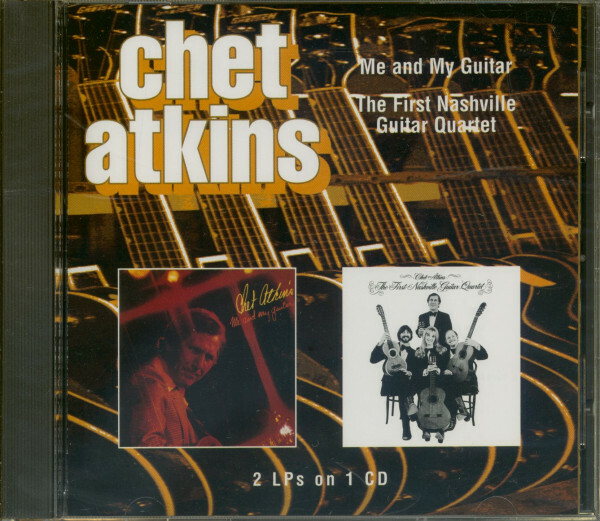 In 2002, a year after he died following a lengthy bout with cancer, Chet Atkins was inducted into the Rock and Roll Hall of Fame in their 'sideman' category. The honor recognized his work in Nashville's studios, including his behind-the-scenes roles in the early hits of Elvis Presley and his friends, the Everly Brothers. Twenty-nine years earlier, he'd been the youngest inductee to the Country Music Hall of Fame. The rationale behind his induction into the Rock and Roll Hall of Fame actually went beyond that. It's impossible to wander through rock 'n' roll history without tramping on guitarists who drank from Chet's musical fountainhead. Early on, there was Scotty Moore, Eddie Cochran and Duane Eddy. The Ventures' Don Wilson and Bob Bogle owe their careers to one Atkins album cut. George Harrison invoked his style on Beatles tracks like I'm A Loser. His influence on John Fogerty and Mark Knopfler was obvious. In country, Jerry Reed, Doc Watson, Paul Yandell, Marcel Dadi, Steve Wariner, Vince Gill, Odell Martin and Tommy Emmanuel traced at least part of their musical lineage to Chet. His jazz admirers included Lenny Breau, Johnny Smith, Les Paul, Earl Klugh and George Benson. Classical guitar luminaries Christopher Parkening and Chet's occasional collaborator Liona Boyd were friends and fans. His penchant for electronic experimentation, cultivated as a teenager, yielded some profound innovations. The homemade electronic effects he created and used on some of his records might not have had names like 'wah-wah' or 'chorus,' but in the late 60s, Jimi Hendrix, Eric Clapton and others used foot-controlled versions miniaturized by transistors, readily available to anyone. To Chet's credit, he used them to enhance his music, not as shallow gimmickry. If the 1946-54 phase of Atkins's recording career was a slow ramping up, the 1955-1960 era defined his future. It went beyond singles that sold better than they had at first. In an era when albums were little more than afterthoughts for most country acts, they became his primary medium. He wasn't just the first country instrumentalist to become a successful album artist; he sold to pop fans who wouldn't have considered listening to other country musicians. During these six years, Atkins became a full-blown RCA producer. Then, just as he gained confidence in the control room, he faced the biggest challenge of his career as rock 'n' roll upended country music's rising popularity. How he handled the challenge became one of his most important legacies. It was no small irony that as he worked to revive country, that he, as part of his duties, played on and produced RCA rock sessions. As a producer, Atkins's desire to find new sounds gave him a larger, broader palette. Even so, the fact remained that his RCA superiors expected results—records that sold and enhanced the corporate bottom line. All this impacted his own records as he sought new sounds and embarked on a quest to play every note flawlessly. Many were trailblazing; a few missed the mark. This collection includes everything: the brilliant, the great, the good and bad. Considering how all this began, and the path, his triumphs are nothing short of miraculous. "Everything that has ever happened to me, I consider a good break…even if I get fired. I think everything happens for the best." It was a journey that began humbly enough in East Tennessee's rural Union County, north of Knoxville amid the Great Smoky Mountains. James Arley Atkins, who worked the railroad and became a voice and piano teacher, had a son, Jim, born in 1912, and a daughter, Willard by his first wife. His second wife, Ida Sharp Atkins, bore him three children: Lowell, Niona, and on June 20, 1924, Chester Burton Atkins. His childhood, spent on a farm near Luttrell, mixed music with poverty, illness and pain. Half brother Jim, 12 years older, became Chet's first musical hero. He took his guitar playing seriously and left home as a teenager to begin his professional music career. Chester heard the records of Jimmie Rodgers and the Carter Family and started plunking a ukulele. Two years after his parents' 1930 divorce came a new stepfather, Willie Strevel, who owned two guitars. Chester swapped him some rifles for a guitar and began playing obsessively, a balm for the pain of poverty around him. He taught himself to play a fiddle given him by an uncle, and for a time he, Lowell, and Niona had a small band. Chester once amazed Strevel, who tried to emulate the guitar work on blues records by Blind Lemon Jefferson, when he outdid his stepdad. Nineteen-thirty-six brought Chester another trauma: an asthma attack so severe that James Atkins returned to take Chester to the more favorable climate of his rural Georgia farm. For a shy kid, it was a rough transition. But he adjusted and, when offered the chance to return home, decided to stay in Georgia. When he wasn't in school, he drank in music wherever he could. Fascinated by electronics, he built a radio. He could hear Jim Atkins, who'd worked on Chicago's 'WLS National Barn Dance,'playing rhythm guitar with Les Paul's Trio in New York on Fred Waring's NBC radio show. He also enjoyed Chicago guitar ace George Barnes. One night in 1939, Merle Travis's syncopated thumb and index finger guitar style, broadcast live from WLW in Cincinnati, came through his radio and changed his life. He assumed--incorrectly—that Travis used the right hand thumb and two fingers. By teaching himself to pick that way, he sowed the seeds of the Atkins approach to fingerstyle guitar. After his 1942 high school graduation in Georgia, he got a job at WNOX in Knoxville, playing fiddle with singer Bill Carlisle and comic Archie Campbell. After station boss Lowell Blanchard heard him picking on a borrowed guitar, Chester became featured guitarist on the station's noontime 'Mid-Day Merry Go-Round.' Blanchard encouraged his insatiable appetite for music by slipping him a key to WNOX's music library. He heard Andres Segovia's classical guitar playing and discovered Belgian gypsy jazz guitarist Django Reinhardt, his newest hero. Leaving WNOX in mid 1945, he spent six months at WLW and met two fellow Djangophiles: guitarist Homer Haynes and mandolinist Jethro Burns, better known as comics Homer & Jethro. He also met singer Leona Johnson, and married her a year later. Travis, living in California, visited WLW and heaped praise on his young disciple, beginning a lifelong friendship. Laid off late in 1945, Atkins worked briefly in Raleigh, North Carolina with Johnnie and Jack then moved to Chicago bent on landing a job with Red Foley, about to bolt the 'National Barn Dance' for the Opry. 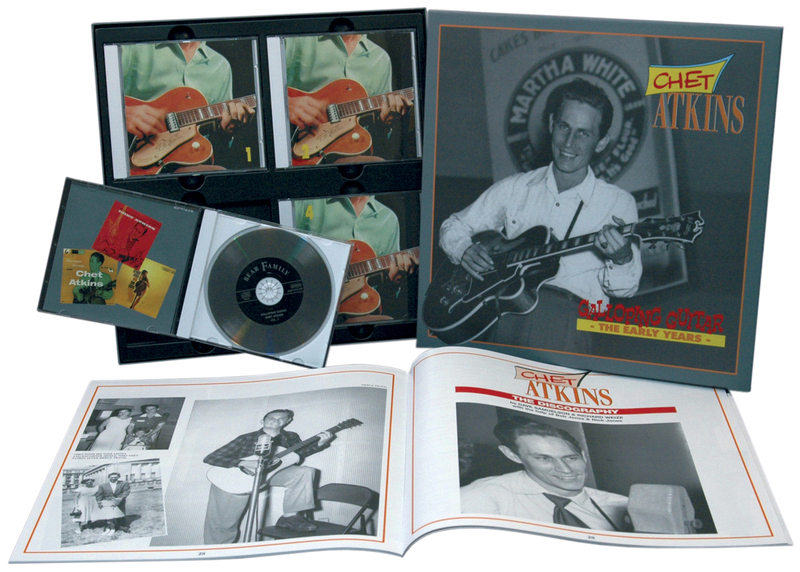 When he debuted on the show in April 1946, Atkins was his guitarist, allowed an instrumental solo on Foley's Opry spots. The Nashville stay was brief. When the ad agency made Foley eliminate Atkins' solo, Atkins quit. Before leaving town, he recorded Guitar Blues for Nashville-based Bullet Records. A move to WRVA in Richmond, Virginia lasted only a month. By 1947 he was at KWTO in Springfield, Missouri, where station booking agent and producer Si Siman started calling him 'Chet.' He and Leona now had a daughter Merle, named for Merle Travis. With Travis himself having hit singles featuring his picking, Siman sent transcription discs of Chet's playing to various record companies, assuming one of them might want their own Travis. He then left on vacation. A bureaucrat filling his spot decided Chet played too much pop for a country guitarist and fired him. Chet moved to Denver and played with Shorty Thompson's Western Swing band when Siman struck paydirt. Steve Sholes, RCA's country A&R head was interested. Chet got a call in Denver and verbally accepted an RCA contract to sing and play. Thompson insisted on going along to sing. When Chet demurred, Thompson fired him. Chet did his first RCA session in Chicago in August, 1947. He and Sholes became friendly. By 1948, Chet was back at WNOX, performing on their Saturday night 'Tennessee Barn Dance'with Homer & Jethro, who backed him on many of his 1949-1953 RCA recordings like Galloping On The Guitar and Main Street Breakdown. The vocals went by the wayside. In 1949, Chet joined Mother Maybelle and the Carter Sisters, led by original Carter Family member (and country guitar great) Maybelle Carter and her daughters June, Helen and Anita. They settled at KWTO, where they played showdates, recorded for RCA and for Siman's RadiOzark Transcription service. After an early 1950 Opry guest appearance, WSM's Jack Stapp offered the Carters an Opry spot. The Carters. Not Chet. Stapp explained to Ezra 'Pop' Carter, Maybelle's husband and the act's manager, that Nashville guitarists didn't want Chet competing with them. Carter, a tough Virginian who considered the Atkinses part of their extended family, was equally firm. Everyone came, or no one did. It went back and forth until WSM gave in. Chet, Leona and Merle arrived with the Carters in Nashville in June, 1950. 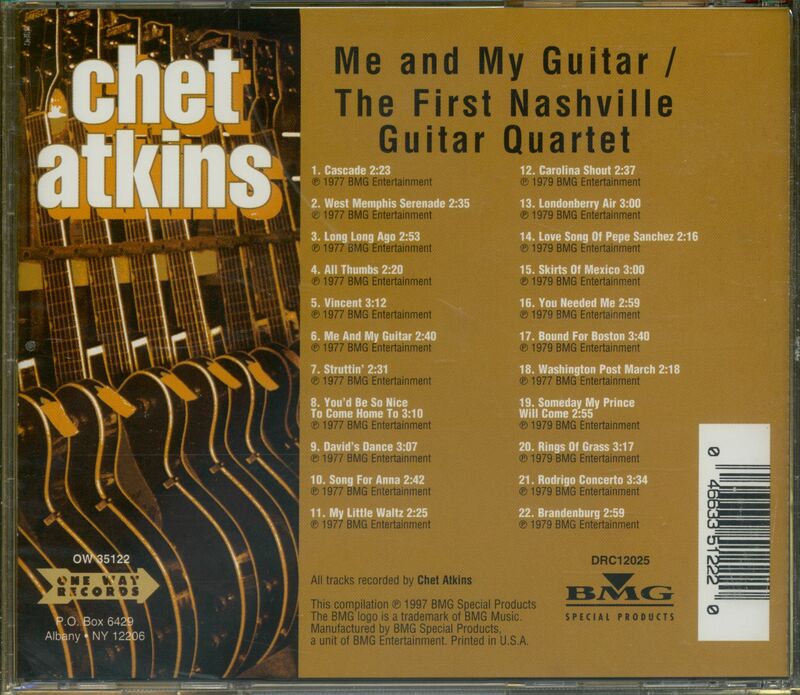 Kundenbewertungen für "Me And My Guitar - The First Nashville Guitar Quartet (CD)"